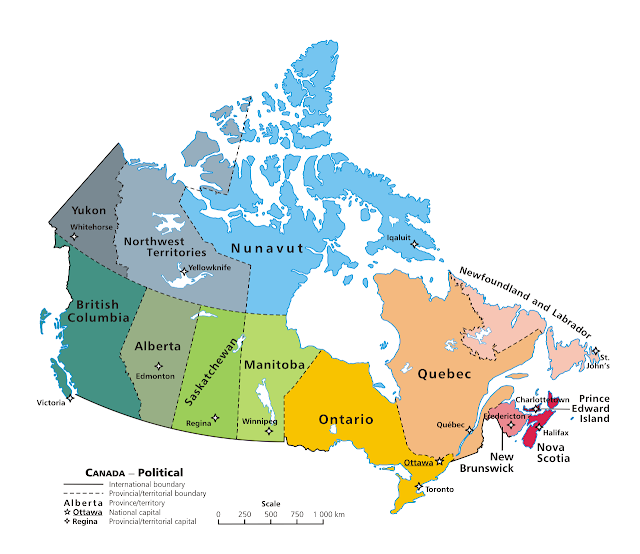 Canadian provinces and their capital cities. First up, we have Newfoundland. We've only been there once, back in July of 1994 when we took our kids (then 8 and 6) on a two week tent camping trip to "The Rock", as it is affectionately known here in Canada. Apparently there are more moose in Newfoundland than there are people. We never saw one the whole time we were there! We'd love to go there again and take Sherman (our motorhome) with us. July 18, 1994. 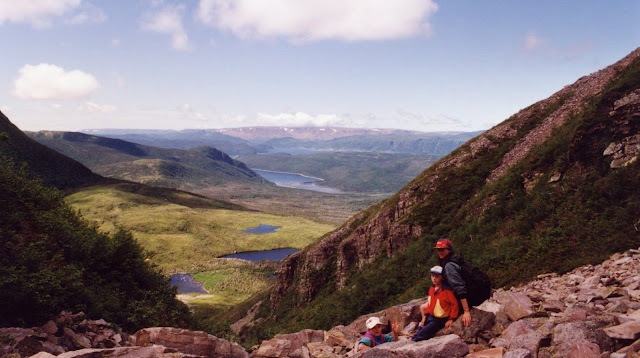 Hiking Gros Morne Mountain in Newfoundland. Next up in Nova Scotia. We've spent a lot of time in Nova Scotia because our daughter and her family lived there for several years so of course we visited quite a few times. And, we've toured the province twice in our motorhome. Nova Scotia has some of the best free boondocking spots in Canada! And, it also has one of the most scenic drives in the world, the Cabot Trail on Cape Breton Island. The Cabot Trail on Nova Scotia's Cape Breton Island. Heading west, we come across the tiny Canadian province of Prince Edward Island. Often simply called PEI, it is home to red sand beaches, lighthouses, and an interior of fertile farmland growing the best potatoes in Canada. I once rode my bicycle all the way across PEI when I was 14 years old! We also rented a cottage there for a week back in 1997 as our summer vacation. And we spent six weeks there in the summer of 2008 work camping at a KOA campground. The red coastline near Cavendish Beach in Prince Edward Island National Park. Ruth, standing on the ocean floor at the tide worn rocks at The Rocks Provincial Park, New Brunswick. Next up is Quebec, Canada's politically divisive province. There's always some movement afoot to take Quebec out of Canada, and it almost happened with a referendum back in 1995. The results of that referendum had the highest voter turnout in Quebec history (93%) with the "No" side squeaking through with a victorious 50.6% vs 49.4% for the separatists. We've spent a fair bit of time in Quebec, and we think the best city to visit there is Quebec City itself! Definitely worth a visit. The closest you can get to Europe without leaving Canada! Quebec City skyline and the historic Chateau Frontenac Hotel. Ontario is where we were both born and raised. We spent most of our lives in Ontario, and I think we've been just about everywhere in that province. Ontario has two major cities...Toronto, and Ottawa. 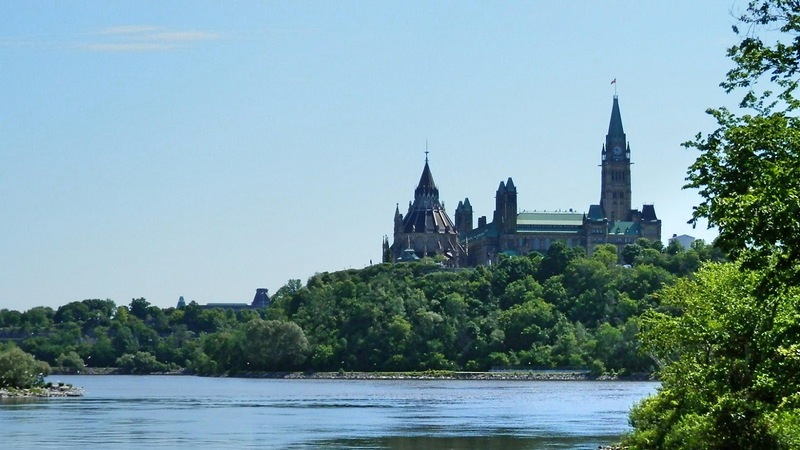 Toronto is the capital of the province of Ontario, however Ottawa is the capital of Canada! We've spent most of our lives in Ottawa. It's certainly the best place to spend Canada Day...what a great party they put on in the downtown area today! The Canadian Parliament buildings in Ottawa, Ontario. Manitoba is another province that we haven't spent much time in. Again, it's usually because we're passing through in our way to another part of the country. I'd like to see a little more of the northern part of that province, especially Churchill, Manitoba where it's famous for polar bears. We'll make it up there some day! Downtown Winnipeg. Affectionately known as "Winterpeg" due it's brutally cold winters! Saskatchewan... our current home province! My father was born in Saskatchewan in the city of Moose Jaw. Saskatchewan is home to wheat fields and prairie grass. And also the most dedicated group of Canadian football fans in the whole country! Seems that when the Saskatchewan Roughriders have a game the entire province must be watching it. It's a big deal here, and good for them for being such enthusiastic supporters. A freshly harvested hay field in Saskatchewan. Next up is Alberta. Most well known around the world for it's beautiful Canadian National Parks. Home to the Rocky Mountains, oil, and a zero percent retail sales tax! There is a lot to see in Alberta and you could spend a lot of time exploring. Near Jasper National Park, Alberta. 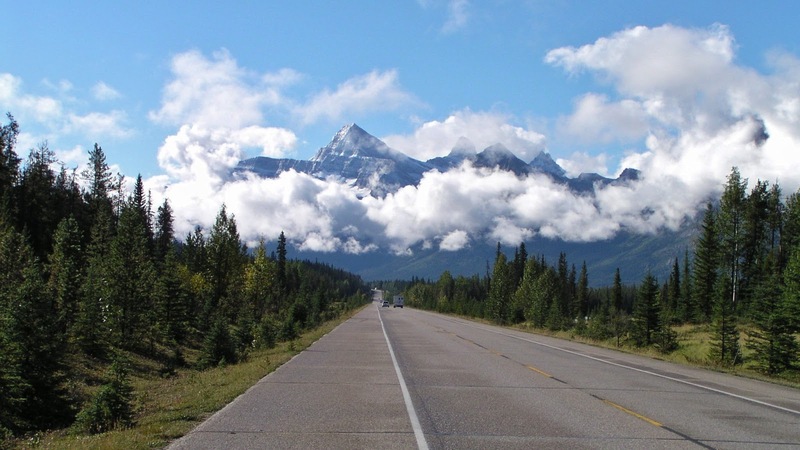 The furthest western province in Canada is British Columbia. Most Canadians simply call it B.C.. Also known as "God's Country" to the people who live there. My father's family is spread around B.C., and as a family we had several vacations out there when I was a child. I still have aunts and uncles and cousins spread around that province and we're going to have a plan a visit there one year soon to see some of the family that we haven't seen for a while. 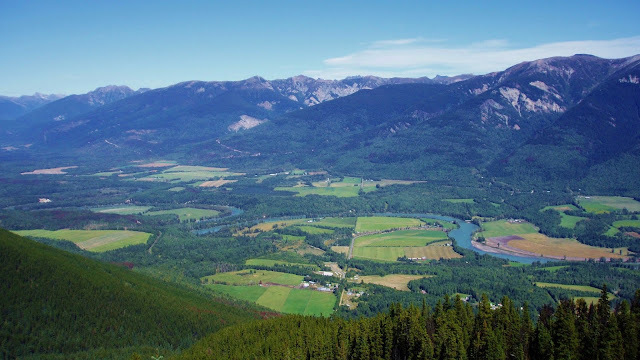 The Fraser River Valley at Dunster, B.C.. My grandfather farmed here in the 1950's and 60's. What a beautiful place. We've never been to the northern territories, but we'll make it there some day. When we're not working anymore during the summer, we want to take the motorhome up there. So that's our Canada in ten pictures! Happy Birthday, Canada! A great deal on a selfie stick on Amazon.com. This one is top quality and I've never seen it this cheap! Selfie Stick, One-piece U-Shape Self-portrait Monopod with built-in Bluetooth Remote Shutter. Neat idea to celebrate Canada Day! You could be right Wendy...a farmer, I am not! I've lived in Canada 44 years now (born in USA) and only been to 4 Provinces! I really need to get Quebec, heard its beautiful and great food. My stepson is in New Brunswick right now with the Military. I also want to go to the Maritimes, maybe a future summer road trip is in order! We would definitely like to see more of both Quebec and New Brunswick. Quebec has some beautiful National Parks that we would love to hike in and we have not really spent much time in the interior part of New Brunswick. Definitely think you need to plan a road trip east! Happy Canada Day. I really like how you shared Canada with us. Thank you Jim and Sandie! I have been near all of your pictures but have also been in the Yukon.! Yukon, is definitely on our list...one day! Excellent post! Happy Canada day eh! Thank you Peter, hope you had a good day too! Lovely way to honor your country today! My great grandparents were from the southwest area of Ontario, the Branton's & Forbes families :) I have fond memories of playing in the orchestra in Victoria on Victoria Day every spring during my high school years as well as all the camping my family did in British Columbia & Alberta. Enjoy your day! Thank you Lori! You could spend ages camping all around British Columbia and Alberta and still not see it all. They both have some of the most beautiful scenery in Canada. Paul has been fishing in Labrador. He said it is gorgeous waaaaaay up there. Happy Canada Day to you both. Nice post. Happy Canada Day. Thank you Contessa, ope you had a good one too! Great post...really enjoyed your take on things!! Happy Canada Day!! Thanks Doug and Nancy! Hope you had a great Canada Day too. Happy Canada Day! Nice tribute. I can relate to some of those pictures! Took me 57 years but I got to Canada. A beautiful country with wonderful people and lots of our rv friends are from Canada. Very different in many ways but similar in many. Happy Canada Day! Happy Canada Day, excellent post. Thanks George, hope you had a good day too! I am sorry The Cynical Sailor, I went to delete my comment to you because of a spelling error and accidentally deleted to whole thread. Luckily I had copied my reply and I still had your original comment in my email so here it is with my reply. Happy Canada Day! I've always wanted to go to PEI and do the whole Anne of Green Gables thing. I know very little about Canada so I really enjoyed this post. I would love to visit each province. I am excited to visit the Toronto area next month while we spend 3 weeks with our son and his family in Grand Island, NY. What would you recommend as spots not to be missed? Also, any recommendations for good eats? Each province is unique and they all have beautiful and interesting places to visit. We would highly recommend a trip up here especially with your dollar being stronger than ours. Toronto is a cool city and has lots to offer. The Toronto Science Centre is huge and would take a full day to go through. High Park is a wonderful place to stroll around, Toronto Island, downtown of course and Kensington Market area which is just west of the downtwon section. As for sports, we would say don't miss a Blue Jays baseball game. I'm afraid we don't eat out much so we can't really recommend any good places to eat but I know there are lots of them out there. Poutine is Canadian not to miss eat, it is french fries with gravy and cheese curds. There are even some gourmet varieties of this too. Have fun!